ON/OFF/ON switch for operating pump direction. Lever type directional flow control. Four swivel caster design allows for easy movement and storage of the filter. Quick disconnect hose connections make it easy to assemble and disassemble. 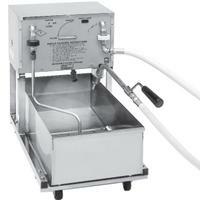 Low profile allows for easy placement under the fryer drain. Easy to remove filter media assembly for quick and easy filter paper replacement. Lift out filter pan for easy cleaning.